Our team’s vast experience with designing complex fired heaters is a key ingredient that has enabled us to surpass our competitors when it comes to asphalt heating technology. American Heating Company has designed a wide array of asphalt heaters that are being used to heat A/C 20, blown asphalt used in roofing shingle production, and other grades of asphalt used in a variety of applications. Our heaters are ASME code compliant, made in the USA, constructed with high-quality materials and built with durability and functionality in mind. While this puts us ahead of many of our competitors, what truly sets us apart is our unique asphalt heater design. While most industrial heating equipment manufacturers produce thermal fluid heaters featuring helical coils, all of our innovative and cost-effective asphalt heaters are designed utilizing a unique serpentine coil. These expertly-designed coils help our heaters to be some of the most efficient on the market, and come standard in our asphalt heaters. 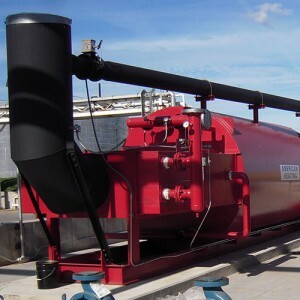 Featuring a high volume combustion chamber and a large quantity of radiant section surface area, our asphalt heaters have low heat transfer rates and low film temperatures. This enables our heaters to run efficiently and require very minimal service and maintenance. As a result, you can keep your plant up and running, saving you time and profits you may have otherwise lost due to upkeep and necessary repairs. When you purchase an asphalt heater from American Heating Company you can feel confident knowing that you are investing in a durable, reliable, and technologically advanced asphalt heater your facility can depend on. We pride ourselves on helping our clients in the asphalt and roofing industries get ahead by providing them with heating equipment they can trust. 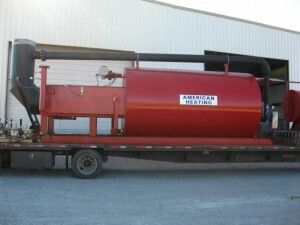 If you’re in the market for an industrial asphalt heater, turn to the experts at American Heating Company. 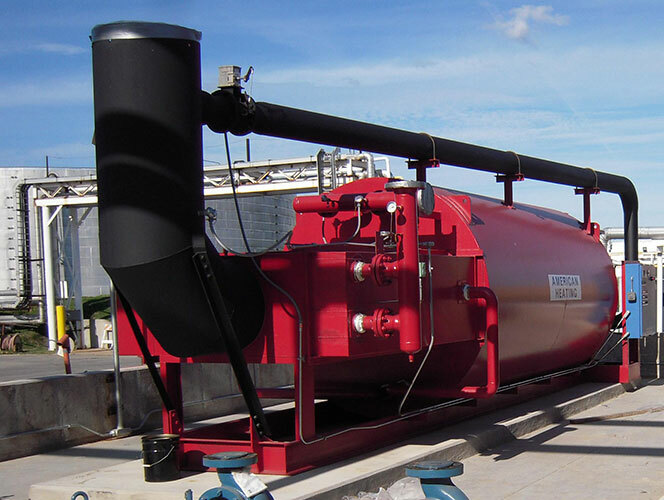 Whether you’re looking for a standard asphalt heater or you’re in need of a customized asphalt heating solution, our team can work with you to design and manufacture an asphalt heating system that suits the needs of your individual facility. Equip your plant with the best of the best when it comes to asphalt heaters. Give us a call today at (973) 777-0100 or contact us online to learn more about our asphalt heaters and heating systems. Interested in asphalt heater pricing? Request a quote from American Heating Company today. Want to learn more about how to keep your asphalt plant ahead of the game? Read our tips for making the most of the off-season and preparing your asphalt plant heating equipment for production season.